There is a little wood at one end of our garden with a stream running through it. And over the other side of the little stream there are several old trees and decaying tree stumps. It’s rather overgrown across the stream, ideal for wildlife. We wondered if anything was using the holes at the base of this old tree stump, so David set up a wildlife camera – and found that rabbits have taken up residence, running in and out of the holes at the base of the tree. The rabbits have made a path at the side of the tree up to a grassed area where Heidi, our cat, sits for hours on rabbit watch waiting for them to come out and play. Unfortunately her ‘play’ is a little rough for the baby rabbits and we have had to rescue a couple. There is a field at the back of our garden which is on a steep slope (it is much steeper than it looks in my photos). A couple of weeks ago I spotted three roe deer at the top of the field, grazing, and quickly took a few photos using the zoom lens. They soon were aware I was around and began to move away. They jumped over the fence and were soon out of sight. You can just see their white rumps – one getting ready to jump and two on the other side. 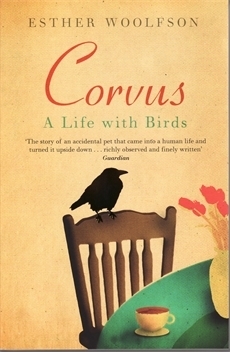 See more Saturday Snapshots on Alyce’s blog At Home With Books. Early yesterday morning I was sitting at the computer when a movement outside caught my eye. My desk faces the window looking out onto the back garden. I thought maybe someone was taking an early morning walk along the footpath just beyond our garden fence, but no – it was a deer. For once my camera was on the desk, with a card in and the battery wasn’t flat. Quickly I zoomed in and took a few photos because normally wildlife doesn’t hang around when I’m taking photos. going behind the trees and out of sight. I thought that was that and he’d left the garden, but not so. For the next 30 minutes or so I could see him wandering around that part of the garden going backwards and forwards eating leaves and generally mooching about. I began to wonder if he couldn’t get out, but presumably as he’d got in he could get out. So I had my breakfast and then saw him again, this time moving towards the house. He jumped over our little stream and ran across the side garden. He then went towards the road side fence and we were bothered he’d jump over onto the road. So Dave went out to the front garden to the other side of the fence from the deer and he ran back over the stream and disappeared. Later in the morning I went over to the back garden and found strands of hair caught on the fence where he had jumped over it. He was in the garden for nearly an hour! He was much bigger than he looks in the photos and I think he’s a Roe Deer. To participate in Alyce’s Saturday Snapshot meme post a photo that you (or a friend or family member) have taken. Photos can be old or new, and be of any subject as long as they are clean and appropriate for all eyes to see. How much detail you give in the caption is entirely up to you. All Alyce asks is that you don’t post random photos that you find online. What Will Our Garden Grow? Looking out of the window this morning we saw that the bird feeders had been knocked of the tree and their contents spilled on the ground. Then a squirrel appeared, grabbed some nuts and cavorted round the garden burying them in the borders but mostly in the lawn. Author MargaretPosted on October 3, 2008 Categories Garden, WildlifeTags Squirrel7 Comments on What Will Our Garden Grow? 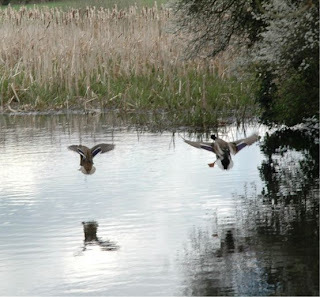 On Monday D and I went for a walk with a friend alongside the Wendover Arm of the Grand Union Canal. It was a beautiful, sunny day and we enjoyed these views. This is the start of our walk. The Wendover Arm was first constructed in 1797, but as sections of it leaked it was “de-watered”. From 1989 onwards it has been restored and this is what it looks like today. Kingfishers can be seen along the canal, but we didn’t see any on Monday. 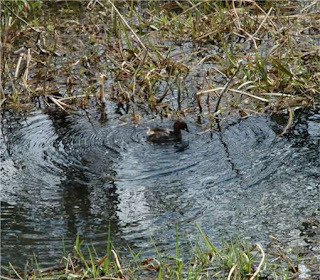 There were lots of other birds though, ducks, moorhens, coots and dabchicks (otherwise known as little grebes), busy diving and collecting nest material. 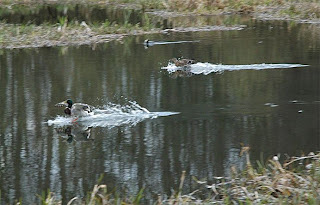 The ducks were in fine form, taking off a high speed and then landing with legs flailing before splash-down. 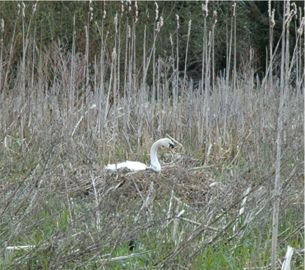 Further along the canal we saw a swan sitting on a large nest over on the other side. 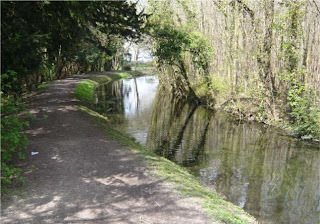 The canal opens up into an area known as the Wides, with areas of grass and shrubs with a tiny island on the far side. Trees have invaded what was once open water and without management the canal would disappear in a few years. 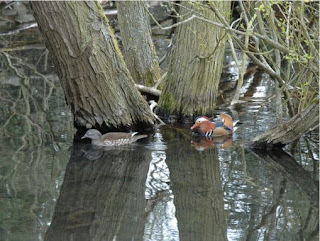 Then came a surprise – a pair of mandarin ducks. I’d never seen these before; they looked very different from the other birds on the canal, but just so beautiful. 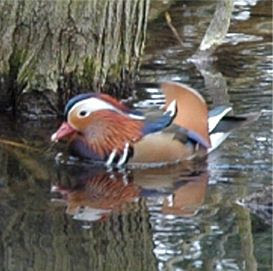 The male has very distinctive chestnut brown and orange fan wings sticking up above his body, whilst the female is a duller brown with white spots. They were swimming together in and out of the trees. When I came home I looked them up in our bird books. 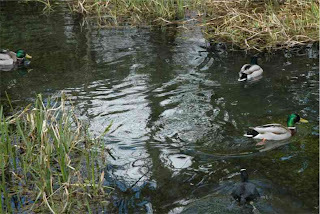 Originally from China these ducks like streams and overgrown lakesides in broad leaved woodland and they nest in tree cavities. The canal is the perfect place for them. This is the usual view of a bat flying – in the dark, but I was surprised yesterday afternoon to see a little bat flying in the garden in bright sunshine. It swooped down over the back fence and flew to the flowering cherry tree in the middle of the lawn, where it flopped down to the ground at the base of the tree. Before I could get there Lucy, our cat, was there like lightning, most interested in the little bat. I called her off, but the bat seemed to be stuck at the bottom of the tree, with its wings spread out wide. We tried to move it gently away from the tree and it flapped its wings feebly and then folded them around its body and crawled slowly along the grass. Unsure of the best thing to do, we decided to take it to St Tiggywinkles the local Wildlife Hospital. They identified it as a “teenage” Pipistrelle and thanked us for bringing it in. They thought that it would be ok. They will release back in our area as soon as they are sure. Bats are protected by the Wildlife and Countryside Act 1981, which prohibits anybody catching them or disturbing their roost. 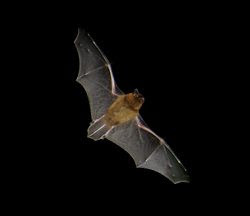 However, it does allow for the handling of bats that are injured or obviously in difficulty, especially those clinging to walls away from a normal roost site, although they must be released as soon as they are fit.